We now have several options to add WiFi to IoT / embedded projects at relatively low cost, and ESP8266 based solutions clearly wins on costs, but are there some advantages to other higher priced modules? 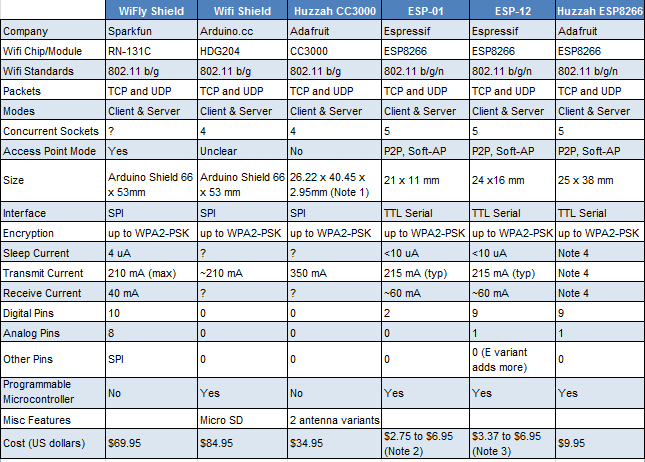 To help us find out, Mike Barela has put up a comparison table with some Wi-FI modules based on Espressif ESP8266, Texas Instruments CC3000, Microchip RN131, and H&D Wireless HDG204 processors. Note 2 & 3 – Adafruit and Sparkfun sell tested units with AT Firmware for $6.95. lower prices are available on eBay, but quality may vary. Note 4 – Currents are probably somewhat higher than stock ESP-12 due to onboard LED and regulator. The comparison is not exhaustive, but it still appears to show ESP8266 solutions support most features than pricer competing modules. There are however case where competing solutions have an edge, for example if you need an Arduino shield, although ESP8622 can be programmed with the Arduino IDE, and some ESP8266 based shields are available, but probably not as well supported (yet?) as the ones from Sparkfun and Adafruit. Mike also considers Arduino shields and CC3000 to have better software support and documentation, although he acknowledges ESP8266 community has help narrowing the gap. Finally, for battery powered systems, TI CC3000 is the best of the list, with Arduino shields not really suitable, and ESP8266 modules could be used but a lack of documented projects with optimized power usage may make such project a little more complicated. You can read Mike’s complete blog post for more on his take. Title states “CC3300”. It should be CC3000. At this price the community will close the gap. I have a few ESP8266 boards. They Ti support for C3300 board is absolutely top notch. (The actual designers answer questions on the forum) But, OMFG, the price of the ESP 8266 and access the the CPU on chip is totally amazing. Sizes on the shields looks wrong, 2100x2600mm is really huge! TI’s CC3200 also provides on-chip CPU access. In fact it has 2 separate cores – cortex-m3 for use app, and something else for radio part. This has some advantages, but this price is higher. This post copied from http://21stdigitalhome.blogspot.com/ – the original does not have the errors. Please take your copy down and link to the original. It is under $1 in quantity. but their wired modules (enc286j60) are nice because they implement only the physical layer.. leaving your host platform to implement the tcp/ip stack. Much more control if you want it! There’s a typo in the title. It’s actually ESP8266 not ESP8622. What about hlk-m35 (mt7681, $4-5) and hf-lpb300 (88mw300). Actually the latter seems unavailable and maybe hard to get access to marvell sdk but if the new electric imp which is also based on the Marvell chipset can sell for $4 @10k then leaves room for optimism. Could you add a column on SSL support with # of SSL conns. From what I have read, the 8266 supports SSL but only 1 concurrent socket connection. If you provide the data, I’ll add it to the table. That’s a good catch. can the os inside esp8266 be modified to run as real host OS? currently it’s used as a serial module, can the esp8266 run as a real host cpu while providing wifi? that way it can be used 100% independently. search FreeRtos + esp8266 since my link with get moderated. Most people don’t bother with an OS on the ESP8266. The SDK provides a library that you link into your app that interfaces with the bare metal. I think since you are a regular poster, a single link won’t be moderated. Post with two links are always moderated. Even though I’m not online that often right now, a moderated post should make it within 24 to 48 hours. I know ESP8266 very well, but ESP8622??? I wanted to pinpoint the mistake in the heading. It is fixed now. It is just a typo, ESP8622 does not exist. Good post – it’s really important to put all features in one place for better selection. I think the table is missing two big devices in the IOT market – CC3100 and CC3200. I would add to the table SSL support, networking protocols (like HTTP server), Documentation and support. Any idea at what quantity? You can get it for $1.08 quantity 1 on taobao right now. I’ve heard that if buy 10 reels or more direct you might be able to negotiate as low as $0.80. Ooop, that was an ESP8089. I suspect $0.80 was the ESP8089, the lowest I’ve heard for real is $1. Yes this was in my mind something 1.6$. Before we have a big volume requirement something 20K. But we can’t find right solution on time that we also required high throughput and sleep mode. It still looks difficult to find module with feature of “High Throughput & Sleep Mode”. You will not beat the cost/benefit of the ESP8266. Any other chip on the market is 2x-3x more. You can make a sleep mode using an external chip. For example TI has a chip that consumes almost no power and can delay from 30sec to several days. Then it powers on the bigger chip. Hopefully the next ESP8266 version will have a better sleep mode. (ESP8266 does have one right now, it just isn’t very power efficient). The ESP8266 was not designed for battery use. It’s original target was as a controller for LED light bulbs. Modules are pretty cost effective for ESP8266. These ESP12 ones have legitimate FCC approval and are under $2.